At R.E.M. Residential, community is important to us. We strive to make a difference in all that we do. That is not limited to making a difference to our clients’ lives and those of their tenants, but also to the community and the world. As a result, R.E.M. Residential is involved with many charities and community outreach. We are honored and delighted to consistently be recognized for our commitment to our clients, their tenants and to improving the industry. Please read more below. The Pioneer Award is given to companies who spearhead innovation across their organization, including the use of technology in what was once (and still often is) a paper-heavy industry. R.E.M. Residential has consistently embraced new and forward-thinking ways of improving their operations, and is willing to think bigger in order to provide their clients with exceptional service. SiteCompli’s Checkmark Awards Committee is proud to name R.E.M. Residential as the inaugural recipient of the Pioneer Award, given in 2017. R.E.M. Residential was honored to be named the Property Manager Of The Year in 2016. The award was presented by NYARM – the New York Association of Realty Managers. This prestigious award was presented to R.E.M. Residential, recognizing our years of effort, hard work, and commitment to our clients and their tenants. R.E.M. Residential is proud that not only the company – but every individual within our company- have an unmatched work ethic. We strive to ensure that every building is improved beyond our clients’ expectations. We make certain that tenants are happy, and that nothing falls between the cracks with compliance. Every one of our staff members is committed, works long hard hours, collaborates as a team, and ensure that our results are unsurpassed. We are deeply moved and honored with receiving this award, knowing that our commitment to service has been recognized. In 2014 REM Residential was honored with the Trailblazing Management Company of the Year Award for innovation in Marketing and Management. At R.EM. Residential we believe our success can have a positive impact on a lot more than just helping investors and landlords. We are very much involved in helping Real estate organizations such as RSA and CHIP, who in turn help fight for the landlords. As we grow, we like to help our communities grow and benefit. For example, each year we attend and donate to JCCA, a very noble cause to help urban children get schooled. We have been active in donating to and attending Happy Faces events, which help children who are terminally ill.
Our holiday parties and real estate networking events are a great way to bring Real estate professionals together and network. We believe our continued success should be shared with those around us. 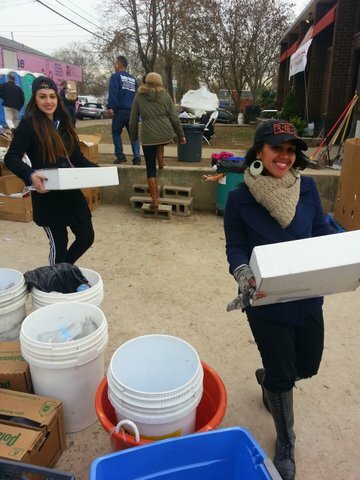 As New Yorkers rose to lend a hand to all those affected by Hurricane Sandy in 2013, R.E.M. joined the cause. We spent most of the days during the super storm glued to the television watching endless tear-jerking pictures of the annihilation of many homes and stunned faces of everyone touched by the tragedy. That’s when we decided R.E.M. will do something to help. Our offices went a week without power, but as soon as power came back on November 3rd, our employees got together and began reaching out to our large network of contractors, vendors and friends in the industry. We were able to raise over $10,000 in monetary donations, as well as multiple donations of various good and supplies. The monetary contributions were used to purchase a tremendous amount of goods and supplies. About 25 of the superintendents, workers, industry friends and family went along to Staten Island on November 16 to help with the distribution of supplies to the devastated communities. As we approached the affected area, we felt the devastation, but it was followed quickly by a proud feeling of being part of this state and this country as the picture of Ariana’s Grand surrounded by FEMA workers, volunteers and tents full of donations came into focus. Our R.E.M. team was warmly received by all. 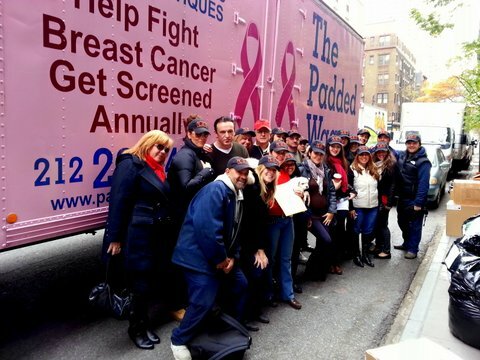 As we went from location to location we unpacked the massive moving truck donated by the Padded Wagon (a hot pink breast cancer awareness truck) in the final location. About 25 people greeted us to unload. It was truly a team effort and very rewarding. Emotions were running high and we knew we were doing something very noble. On our way home, the activities of the day began sinking in. We realized that as a group of people as diverse as our country and our state, with nationalities including Albanians, Croatians, Colombians, Dominicans, Italians, Turkish and Americans, had all come together as one in an effort to unite, help and give. REM spearheaded a hugely successful toy drive in 2014 for children with special needs in Kosova. Every year, REM hosts a lavish Christmas party for their clients, friends and family. This year, REM asked that in lieu of gifts, guests arrive with new, unwrapped toys to be donated and shipped to Kosova. Through REM’s vast network and large social media presence, word spread and the donations started pouring in. People streamed into the office on a daily basis with loads of toys. Deliveries were continuing well past Christmas so it was decided that the toy drive would be extended into the new year. This also gave them time t find a charitable organization they deemed fit for their purpose and mission. In time, they had the privilege of meeting Don Fatmir Koliqi from Kosova and with his help, made arrangements with Caritas Kosova to ship and distribute the toys. In an auspicious twist of fate, the donations were shipped to a refugee camp in Ferizaj, the very city where Rick Elezi was born 50 years prior. REM collected 17 large boxes of toys in total and Caritas was kind enough to send us picture of the happy children. A very rewarding effort for sure.